I have developed a formula which I think allows us to estimate how much time and labor a food growing piece of land will take. 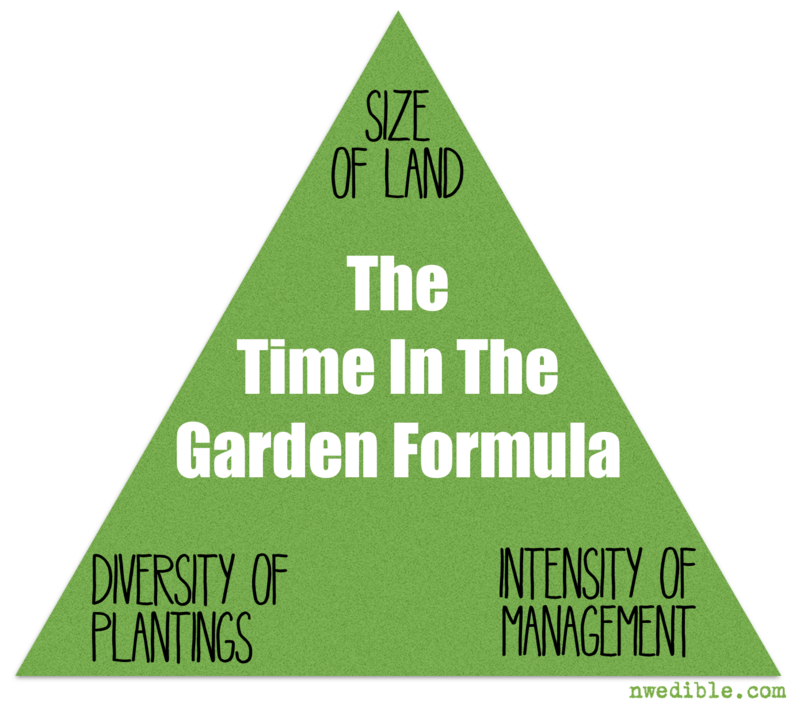 Size of Land x Diversity of Plantings x Intensity of Management = Time and Labor required! Now, there are no units associated with this formula, so it’s not going to spit out some hours per week calculation for you. But it allows us to consider how to create a garden that works for the time we really have. The amount of land you garden, in combination with the diversity of things you grow and the intensity at which you grow them combine to determine how much work your garden or urban farm will be. Let’s compare two very different models of growing food. One dude with the right equipment can grow a single crop of corn or soy across thousands of acres. The amount of land worked is huge, the amount of calories grown are huge, but the diversity is nonexistent and the intensity of the management is pretty moderate. What’s the joke about modern industrial farming: drive and spray, drive and spray? Improvements in management and technology — such as Roundup Ready crops, reduced tillage practices and larger-capacity machinery — have significantly increased the amount of land one person can farm. We now have equipment that can plant 500 acres in a normal day. And it isn’t difficult to find producers who farm 1,000 acres and still have a full-time, salaried job. Think about that: in modern, industrial commodity farming, the crop diversity and management intensity is low enough that growing food on 1000+ acres is part-time work. In contrast let’s look at my least favorite modern homesteaders, the Dervaes Family of Pasadena, California. This family has made quite a name for themselves growing a huge diversity of crops and raising micro livestock on one-fifth of an acre in a very urban area outside LA. They provide for much of their own food needs, sell excess crops to restaurants and local people, raise dairy goats and poultry, brew bio-fuel, use human-powered appliances and generally do a bang-up job of squeezing every last drop of productivity and from their limited space. According to the Dervaes family website, the family grows over 350 different vegetables, herbs, fruits & berries, and harvests 6000 pounds of produce from the 1/10th of an acre that is dedicated to crops. Pretty freaking impressive production, even for a year-round, Zone 10 growing climate. But here’s the key: the family doing this is four fully-grown adults – no children – and as I understand it managing their 1/10th acre homestead is the full time job for all of them. So the intensity and diversity of activities on the Dervaes’ urban farmstead is so high that, even on a tiny urban plot, it takes a huge amount of time and labor to keep it going. They describe their planting style as “square inch” and I believe it. The work input to maintain a very high-intensity annual edible growing system like that is very, very high. Time: Is It On Your Side? So what can these two extreme examples of food production teach the average backyard gardener who has the normal time-constraints of job, family, other hobbies, etc.? For a homestead-focused urban grower, I think it starts by honestly assessing how much labor and time you can give to your garden or backyard farm, and finding the optimum intersection in the land/diversity/intensity triangle based on that. Even small-space gardeners can decrease the land they use for production – taking a raised garden bed or a few patio pots out of production or landscaping annual growing areas with easy-care perennials. I’m not saying that kind of decision isn’t nearly impossible for most of us plant-nerd gardener types, but sometimes downsizing a garden “right-sizes” it. On the other hand, if a gardener is routinely looking at their garden and wishing they had something to do, it’s time to look at expanding. Kill your grass, add another pot, grow vertical, sprout seeds – whatever – if you are itching to put more time into your garden, find a way to expand or squeeze more from the space you have. Or move to the country and buy 14 acres and get goats. That ought to keep you busy. In a recent guest post, my friend Grace argued for not trying to grow it all in a small space, and if you can manage to just say no, I think she’s on to something. Find the right diversity point for your family. Diversity for diversity’s sake – 9 kinds of summer squash for a family of 3 – is just make-work, but the right kind of diversity – lots of beneficial insect attractors and nitrogen fixing support plants, for example – can actually help reduce time and effort in the long run. So be smart about where you reduce diversity and where you increase it. You can moderate the intensity of your gardening, too. Instead of Square Inch Planting, I allocate room in my garden based on half-bed increments. These are 4×4 squares. I rarely plant less than a half-bed at a time, it’s just too fussy for the space I’m managing. You can lower the intensity of your gardening by forgetting season extension techniques, succession sowing, and other time-maximizing techniques. Although not ideal for the Maritime Northwest, it’s ok to opt to just put in your garden once and be done with it. To do this, wait until sometime in mid-May, or whenever the frost-free, warm season is starting in your area. Go out the the nursery, pick up a flat of starts – broccoli, tomatoes, peppers, cabbage, etc. – plus a couple bags of compost and a bag of balanced organic fertilizer. Spend one good afternoon working the compost and a bit of the fertilizer into your garden area and getting everything planted. Poke a few bean and squash seeds in the ground while you are out there and boom, you’re done planting for the year. Now all you have to do is water, weed and harvest. The garden shouldn’t take more than a couple hours a week, depending on the size. Speaking of watering, we can take advantage of technology (just like Mr. 1000 Acre Part-Time Corn Farmer) to lower the intensity of our gardening, too. If I had to hand-water my 17 4’x8′ raised beds, in August everything in my garden would be dead. I am just not that dedicated. Automating your irrigation can be as simple as a sprinkler or some soaker hose hooked up to an irrigation timer. That’s what I have in the front, and it works fine. Out back in the main garden it’s a bit more sophisticated. I have an irrigation controller with multiple zones that lets me easily adjust how much water different parts of the garden are getting. I highly recommend that anyone with a garden more extensive than a few pots think about ways to put those irrigation robots to work. Bonus: you’ll probably save water and have healthier plants too – most people are really quite terrible at hand watering and manage to get the top 1/4-inch of soil wet before calling it quits. Another way to lower the intensity of your garden management is to transition to more perennial food crops. Probably everyone has rhubarb growing, it’s totally ubiquitous. That stuff just comes up. In the Pacific Northwest, it’s easier to grow bramble crops than to get rid of them. Sunchokes are so prolific they piss me off. Blueberries in the right soil are as easy to grow as rhodies and – bonus! – they make blueberries! Plant those types of edibles once, and the ongoing intensity of managing them is very low compared to most annual crops. 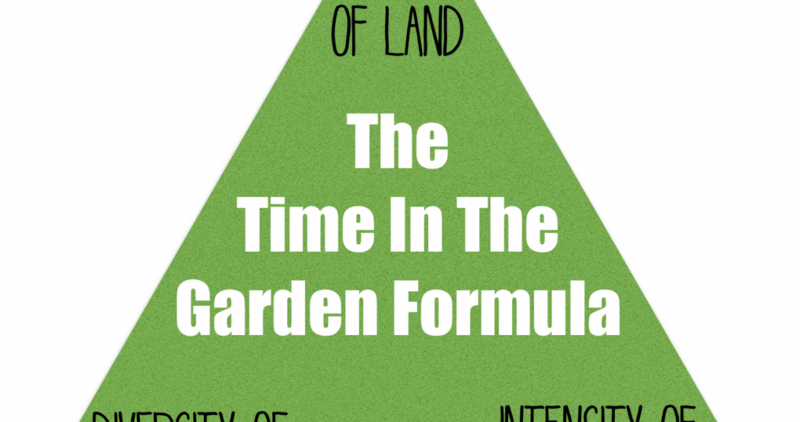 My personal analysis of the Land, Diversity, Intensity triangle intersection showed me that I was over-committed on land and intensity for the amount of Time/Labor I could realistically give my garden. Those kooky permaculture people would say my Zone One was too big. Guys, I’ve spent the last ten years expanding my vegetable growing area, and frankly, I have the basics pretty well dialed in at this point. So to honestly say, “I just can’t take care of all this at this intensity” is a hard pill for me to swallow. Even at my own small-space, backyard level, I can’t garden like the Dervaes. I don’t have the labor, so that degree of intensity isn’t realistic for me. While my family is supportive of my garden and does pitch in, I am the primary gardener and “help” from my children often takes more time than it saves. That’s fine – I’m not just growing cabbage and beans here, I’m also growing awesome little people who need to learn these skills. (I had to tell my son that onion seedlings go root-side-down yesterday; that was pretty hilarious.) I also harvest, cook or otherwise process most of the food I grow, so I am both the farmer and the farmer’s wife. Plus, there’s this full time writing/blogging job thing and the rest of life to attend to. There are only so many hours in the day, and I’m making some changes in my gardening to reflect a reassessment of what I can realistically do. Most notably, I made the decision to pull my hugelkultur beds out of annual vegetable production and plant them in perennial edibles as part of the installation of my new suburban food forest experiment (more on that in a future post). It might seem a bit counter-intuitive to laboriously put in a food forest to reduce work, but I am fairly confident that the long-term management of a perennial food growing area will be less intense than the management of that same area dedicated to year-round annual growing. While I cannot limit my desire for diversity too much (plant hoarders unite!) I’m growing a lot of staple and processing crops this year like potatoes and tomatoes. I’m also growing easy broadcast greens like arugula and green manure crops that do double duty as forage for the hens. Cover crops sown at the right time of year require almost zero work and legume-containing blends can improve soil while growing a lot of yummy biomass for the chickens. I’d encourage any backyard homesteader who might be feeling like their garden demands a bit more time than they really have to do their own assessment and find that right balance point. Don’t be afraid to make adjustments based on the ebb and flow of your life. And remember that when you see showpieces like the Dervaes’ urban farm, they have four adults dedicated to that kind of production. So even if you admire what they are growing, don’t get caught up emulating that set-up if the time and intensity isn’t realistic for your life. Previous Post: « Will A Broody Hen Adopt Chicks? Hi Gayle, I’m also in zone 6 (in Ohio). Strawberries, asparagus and rhubarb are all perennials, so will stay in place until next spring (no offense if you ARE aware, it’s just not quite clear from your post…). The perennials that I grow for summer/fall are mostly small fruit. Blueberries, currants, gooseberries all going in large containers on a roof, plus blackberries and black raspberries around the perimeter of my back yard. Those all crop at different times early through mid/late summer. If you have the room (and a couple of years to wait), dwarf fruit trees are supposed to be good producers. I planted a few last year, and can hardly wait. And herbs. I use the heck out of my sage, thyme and chives. If you’re talking about summer/fall annuals, the most popular are tomatoes and peppers (at least around here, to go by what the garden centers stock). But really I think the best idea when you’re getting started is just to look at what YOU eat the most of, and then look online to see what kind of growing season/space etc it needs and decide if you can accommodate that. Fertilizer I would say depends on your soil situation. Generally, I mix in some compost and an organic general fertilizer in the spring and leave it at that. Maybe some extra for tomatoes when they start to fruit. I’d also look at onions and garlic. You plant them in the fall, they overwinter, and if you leave bits of them in the ground, they’ll sprout up a whole new generation with minimal muss & fuss. Parsnips too work well as fall/winter plants. Depending on your energy and time available in the fall, you can also do a second round of carrots and radishes and greens. Last year we had just moved to the new place and I put up a 9′ tall fence around my 100×50 Zone 1 garden area (just lawn at the time). I had such grand plans of getting the whole thing cultivated. Alas, a new house that needs updates, plus one more tiny baby, plus all kinds of other stuff made that dream fizzle and die for last year. This year I’m being more realistic and focusing on fruit trees and bushes in my Zone 2-3 planned areas. I know I won’t have time to be building all the Zone 1 beds and maintaining them with the new little one with us this spring. Really thought provoking post, thanks. I think we have it about right for us here. About an hour a day on average, which I am good with. The planned expansion might require a bit more thought than I have currently given it :-). How true. Just before we left England, we took on an allotment garden. Those are about 820 square feet. It was much more than we could handle, and it was humbling to see families around us with 2 and 3 allotment plots growing huge amounts of food. That was also the work of two retired adults plus their adult children at weekends. Now we work on our communal rooftop garden and it’s great. About 20-25 of us work on it, and even though the growing area is probably half the size of our old allotment, we manage to get a fair amount of food out of it. It’s not divided into plots, but rather everyone takes what they needs. To be honest, we’re all too polite, there are sternly worded emails about the fact we HAVE to eat all the rocket before it goes to seed. Despite all those hands, though, we had to reduce the variety of vegetables we were growing too. Anyway, just thought I’d throw our slightly different approach in there. I definitely have “eyes bigger than my capability” and I’ve recognized that this season. I feel like I’m cheating when I get nursery starts but the truth of the matter is that I have no space to start seedlings indoors, and at this time of year (I live just south of Tacoma), I have time to dash outside in between rain showers after work and occasionally on weekends and that’s it. Can’t wait to read about your forrest project! This is true of all life’s endeavors. Want to manage (insert anything here)? Set priorities, determine resources, assess success, make changes, assess success and live life in balance. Be content with your decisions, do no harm, and have fun. When it stops being fun, it’s time to sell the farm. I used this same philosophy when managing people and my garden. I think every year a gardener will better optimize their time in the garden. For example I used to plant 2 or 3 rows of string beans – whew! is that a lot of picking. So now it is a half row of garden-to-kitchen in the summer and then, just before fall, a full row that will go into the freezer. To save time weeding, I mark seeded rows with white thread and leave it there. I then hit the weeds with a wheeled cultivator pretty close to the line – once a week whether needed or not. It knocks the weeds back while slow germinating seeds like chard have not sent out any sprouts yet. When I used heavier twine it would clutter up the tiller but thread will decompose or break up in the tiller. I plant in one big flat garden. Then in the Fall I use my commercial grade walk behind mower to chop the stubble. Then a shallow till (pulls up the root balls) with the Troybilt, rake, and cover crop with clover. Collinear hoes are the way to go, precision weeding! Then after the soil has warmed, I lay down shredded leaf mulch. It blocks weeds and save soil moisture. For spinach, I grow about 4 rows of different varieties in spring, harvest into a wheelbarrow that is for harvest only (kept sanitary), take it to the outdoor faucet and wash the leaves, then with one of those turkey friers, blanch in water over the propane flame – mass production! Then into the ice bath and finally freezer bags. “In contrast let’s look at my least favorite modern homesteaders” – this just cracked me all the heck up. I have an 80x50ft yard in which about 2/3 or more is edible or insect-attracting. We do water by hand (hose with a focused nozzle plus watering can) rather than automating it in any fashion. This is in part due to being right smack in the Maritime Northwest (Portland) and part because when we walk through the garden regularly, we see more things that are happening in the garden. We see the early changes, the first bugs, the first holes chewed through, the first caterpillars, and we can take care of problems early on. I’m not saying we’re perfect about it, but the opportunity is there. We enjoy spotting those first flowers, those first fruits, too. Great article. One of the things we do in our average family garden is one cash crop. We will pick a vetable or fruit to grow a multi year supply in addition to our regular plants. That way in canning I can focus on it. This is all great advice; hard-earned, if you’re anything like me. Last year I hit major work burn-out, and I tried my best to keep up with the homestead food production. At the end of the summer, I took stock, remembering Carol Deppe’s discussion of the resilient garden: a garden that doesn’t need a lot of you! My husband reminded me that just because the space is there, doesn’t mean I have to plant it–I can always build soil! I realized in doing my inventory, that I could do a weekend in Feb/March to get onions, brassicas, tomatoes, etc going in the greenhouse. I could spend a weekend in May getting the beans and squash, and even potatoes in. I could spend a weekend in June getting the fall garden starts going. These are all crops that get started in one go, transplanted once, and then ignored but for watering (automated). What got missed? Succession-planting salad greens! I missed eating salad greens. 🙁 So what’s my next project? Finding and planting PERENNIAL salad greens! Woot! After that, I think I’m set to keep my full-time job AND grow most of our food: the chickens and fruit need minimal maintenance, and I think I can keep up with the rest. But it sure has me turned on to permaculture! Looking forward to more info on your food-forest-to-be! I would like to know more about perenial salad greens. What comes immediately to mind are things like dandelions and grape leaves, but I’m wondering if there’s anything else along those lines – particulalry with a more delicate build (closer to lettuce than kale). Thoughts? Thanks for this well thought out post. In our 40s we moved from 1/8 acre to 4 acres. We grow hundreds of pretty things and edible varieties on about one and half of those acres. Now, in our mid-50s we’re tired! We’ve had to make agreements to not start any new beds, and we’ve tried to simplify the plantings we do have. When younger we routinely took out boring shrubs when we bought a place. Now middle-age has showed us the value of a boring plant that just grows slowly without expecting much in return. File the Dervaes homestead into the “Hope for the World” file. With Gaia knows how many more people crowding onto Her in the near future, labor-intensive agriculture is one of the best ways to kill two flies with one swat (that is the Dutch version of killing birds with stone). Not enough room, too many people, what are they all going to do? It beats putting them to work making plastic doohickeys nobody needs. I have no garden (not even a balcony at this point), though I’m looking forward to having one again. That said, when I had a garden and could grow squash and beans, that was pretty much al I grew. That and a wild grape that had taken root by the back steps that I used as more of a substitute for kale than anything fruit-related. And I grew them because they were EASY and versatile and because I could grow them virtically which worked really well in my teeny, tiny postage-stamp of a suburban yard. I have Big Dreams of growing something like a food forest of my own – as many perenial food plants as I can cram into a (typically also postage-stamp-sized) inner-city yard. Which probably means rhubarb, asparagus (or ostrich ferns), raspberries and/or red currants, and some kind of super-hardy fruit tree (space allowing – ahaha), plus a couple of 4×4 (or so) raised beds for winter squash (or pumpkins), rainbow chard, cherry/saladette tomatoes (from starts), and pole beans plus maaaaaaaaaaaaybe some kale and cukes. I’d love to have haskaps or seaberries, but they need polinator plants and I may only have the space for self-polinating species. If I get space at all. I figure anything else I want will be available via CSA, Hidden Harvest picks, and/or friends with country homes a fruit trees. I am now convinced we are living parallel lives. I too am inspired by and long for the type of production that backyard homesteaders such as that family can do. But then there is reality. I too am doing this basically alone, while caring for two preschoolers, the hubby, work, and doing all of the cooking. Sometimes, I wish I could just be a normal person and buy my vegetables from the store. I do experiment with nw varieties every year, but to keep my plot manageable (I’ve got about 1000 sq feet of growing space), I’ve adopted a strategy of mastering one new crop each year. I also focus first on what can be canned or dried for use year-round. We live on half an acre in the suburbs but are essentially self sufficient in all tomato products, jams and jellies, and dried hot peppers (we go through more than most people), and herbs. In recent years, I’ve started making the switch to more perennials as well. This spring, we’ve planted 75 everbearing strawberry plants. We have asparagus beds, rhubarb, and are adding 10 raspberries next month. Next year, we’re adding hazelnut bushes and sour cherries. Two years ago, we planted four apple trees. I think I’m getting pickier. If I’m going to do the work– pruning, watering, canning, etc.– I want the most bang for my time, either in taste, trade value, shelf-life, or money saved at the grocery store, and that is starting to guide my planting decisions. Still, it is fun to try new things, but I think the process of mastering one new crop each year has served us well. After 8 years of this system, we know are ‘masters’ and know how to do 8 crops well, and those will generally go gangbusters and produce well. Then, we toy around with a few new ones every year, giving them the time and attention to really understand them. It sounds sappy, I know. I admit I AM jealous of some other garden farmers I know. I’m part of an urban farming mentoring program now, and most of the other mentees are couples– the whole family is on board helping build their backyard farm– then there is little old me, doing it all alone. No hubby to turn pallets into a chicken coop. Just me trying to figure out how to do it by myself while the kids scream ‘Ma-om” through the back screen door. Ugh. It’s overwhelming, but I have to face it: I’m not normal. I can’t just buy my food at the grocery store. I can’t! Ack! Every article of yours that I read, leads to 4 more I want to read! Your blog is a gardening hydra! I just expanded my garden pretty dramatically over this last winter, and am wondering if I bit off more than I can chew. I really appreciated this article. And the revelation that maybe I don’t have to grow ALL the things. Hmph. I have seeds for pretty much all the things… I have more seeds than I have space to grow them in… but, yeah, balance is good. I also have pesky children who want attention and love. And a house that desperately needs dusting.